The UK's Advertising Standard Authority, the ASA, has now cleared Hello Games, the developers of No Man's Sky, after a lengthy investigation over complaints of misleading advertising. 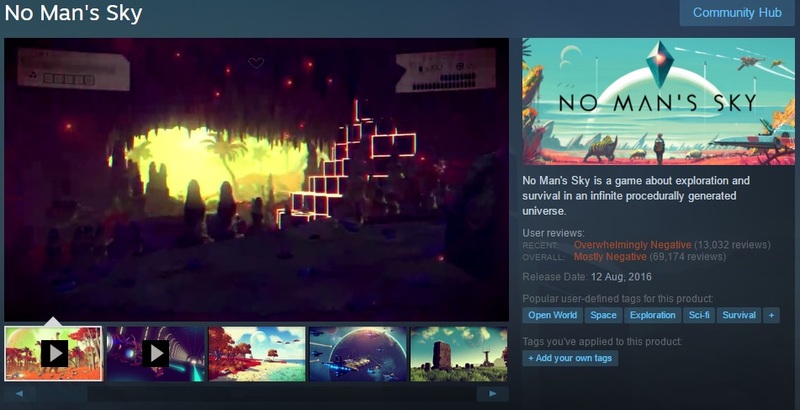 This investigation was regarding Hello Games' promotion of No Man's Sky, which, for the most part, is seen as highly misrepresentative of the game by consumers and critics. The ASA has now ceased their investigation, concluding that the marketing materials for No Man's Sky mostly representative of the final product and were "unlikely to mislead" consumers. Amongst other things, it was alleged that the screenshots and videos used to advertise No Man's Sky is seen by purchasers as presenting better visuals, more complex alien life, space battles and several features that were not present in the game. Below are a few statements from the ASA, stating that the advertisements were not found to be significantly different than the final game, with most differences being insignificant in the eyes of the regulator. It is worth noting here that the ASA has no power to include the lies told by the game's developers in interviews and comments to the media before the release of the game. This means that the game's lack of multiplayer interaction, trade ships, factions, asteroid landings, space station destruction, ringed planets, complex creature behaviour and the presence of crashed ships to explore on planets. Sadly, the ASA cannot include the lack of these features in their investigation, as it was not listed on any trailers, screenshots or in any other advertising materials. the overall impression of the ad was consistent with gameplay and the footage provided, both in terms of that captured by Hello Games and by third parties, and that it did not exaggerate the expected player experience of the game. Most people can agree that No Man's Sky offered a lot less than was promised by the developers, but this investigation clearly highlights how little power the ASA has to investigate and punish developers who intentionally mislead consumers. In the ASA's eyes, Hello Games are completely innocent of any wrongdoing, meaning that developers can promise anything to consumers in interviews and in statements to the media without fear of punishment for "misleading" consumers when they fail to deliver. Hello Games has now delivered their "Foundation Update" for No Man's Sky, delivering some of the promised features that were not present when the game released earlier this year, though even now the game still lacks most of the game's promised features. You can join the discussion on Hello Games being cleared in the ASA's investigation on the OC3D Forums. I don't think it will matter much now. They've tarnished their name, that speaks volumes in gaming these days. Look at that other company who decided to start suing people and the impact it had. "from the footage provided by Hello Games"